Originally a simple beer house in c1832 it would become a popular brewery by the 1860s under the ownership of one, James Carter. 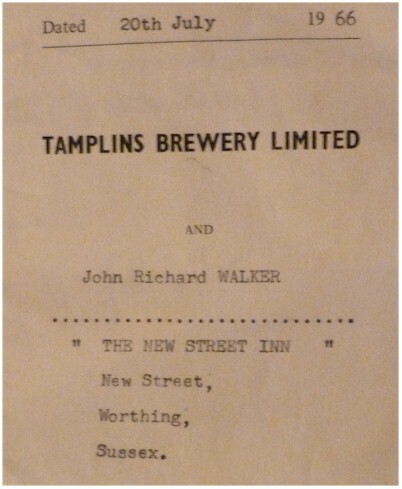 The Carter family had been brewing beer in Worthing since before 1832. 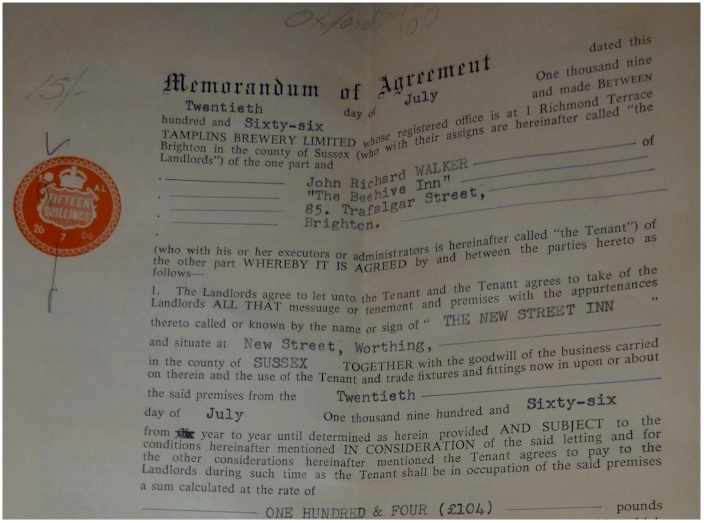 J and R Carter ran a brewery in Chapel road in 1858 and the J in this case may have been James striking out on his own or as part of the family concern later on. The census of 1861 shows a new owner, James Slaughter and his wife Ann. James was listed as a Brewer. Perhaps the most popular name in its history is that of George Pacy. 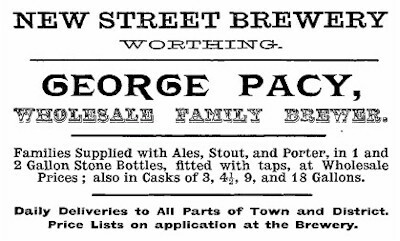 George came from a brewing family background in Bognor Regis. He is listed in 1871 as employing 8 men on the New Street site. The New Street before and after. 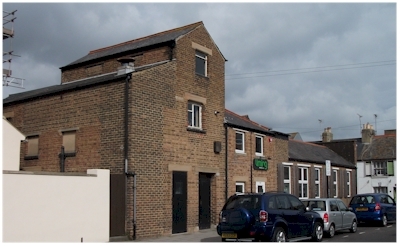 The picture on the left clearly denotes the building as a public house on the outside with a double door entrance to the brewery. 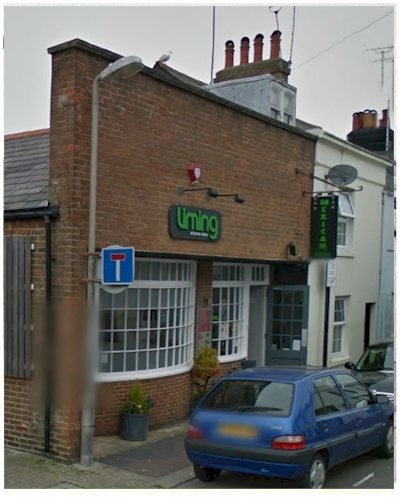 The white building in the second picture is still part of the original frontage, now a private house. This was also the home of George Pacy at the time. of just how large this building is. The rear 'Tower' is typical of brewery design. The road in front is a more recent addition. It was originally just a simple alleyway between the brewery and what is thought to have been fishermen's yards. 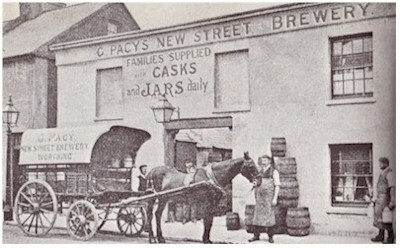 For a period the brewery was known as Pacy's Blood-hole said to have arisen because the fishermen used to gut their catch whilst enjoying a well earned pint. Many believe the fish were gutting on the property but this is highly unlikely. An original Pacy brewery jug with a screw top. I think this style was a later range as earlier versions had the name and address embossed in the ceramic itself. My thanks to Alan Pacy, a descendant of George for permission to photograph this item. George employed the use of a small steam engine for cleaning and washing. 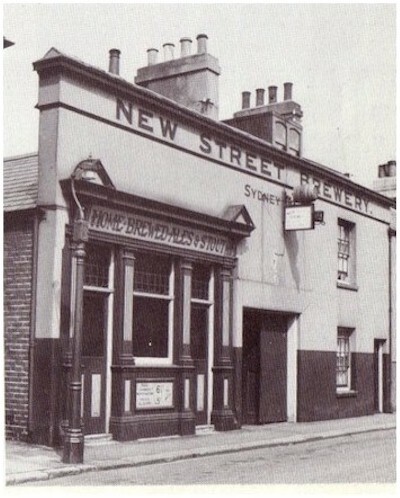 The New Street Brewery that carried the Pacy name was very successful indeed and benefited from its own well. Sadly, one of his young daughters died in the Worthing typhoid epidemic from drinking contaminated water from elsewhere. George himself is buried in Broadwater cemetery. 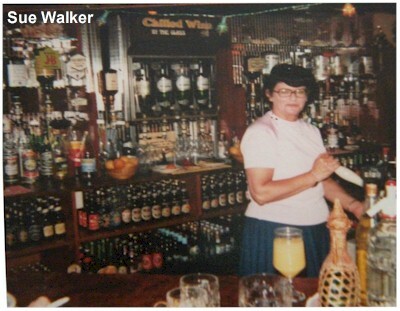 Were you a member of the Over 21 Club? 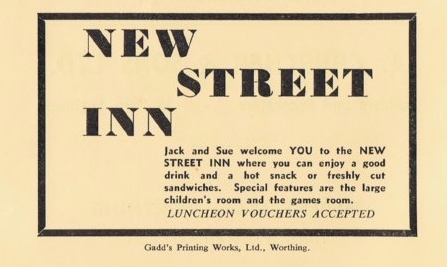 John (Jack) & Sue Walker, licensees of the New Street Inn from 1966 to 1991. 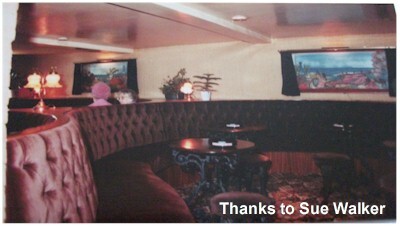 The pub had a refit c1978 and became the Beachcomber. 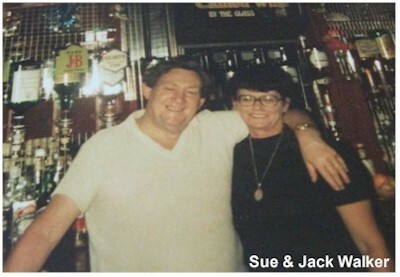 Sue still lived in Worthing, Jack suffered heart problems which prompted them to leave the pub trade. Jack has since sadly passed away. I was fortunate enough to be able to meet Sue for a chat shortly before she died in 2011. She had a marvellous recall of her time at the New Street and fellow landlords whom she remembered fondly. It has been recalled by Dave Hunt of Worthing that great delight was taken by releasing the caged budgies much to the consternation of Sue. The rather plush interior of the new Street inn. Hard to imagine you were sitting inside an 19th century brewery. The 'contract' is not one to be taken lightly at one hundred and four pounds a year. area every three years and the private area every five. An advert for the New Street Inn discovered in the programme of The Pied Piper being performed at the Pavilion theatre in early 1969 by the Pearl Hood and Stanley Wood School of Dancing.